Hello everyone! Claire here. I wanted to say a BIG thank you to everyone who participated in my CAS Sports themed challenge last week. There were so many wonderful projects in the gallery this week and we all enjoyed visiting your blogs to see what you created. Before we get to my choice for Headliner, let's see what caught the eye of the Design Team this week. Su's card made me smile! I don't have many aces, but I know how great it feels when it happens. 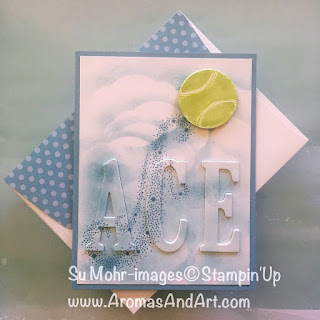 The beautiful clouds and the "swoosh" is the perfect background for the "ACE" eclipse letters. The tennis ball is so realistic and the matching envelope is so much fun! Congratulations Su, you are my Headliner this week! Thank you again to everyone for playing along with us. Congratulations to all our winners, please pick up your badges here. Come back tomorrow for a fun Sketch Challenge from Jaydee! Woo Hoo!! Thank you Sandy for picking my Triathlon card as a Cut Above, this is such a joy and an honor to be in such amazing company. Congratulations to the other winners and the Headliner, awesome cards everyone!!! Thanks Jaydee for choosing me to be in the 'A Cut Above group'.I'm tickled pink ! Thank you so much for the shout out, I am really delighted!